Better brand crisp poly-rayon 5-piece shorts set in ivory. US made. 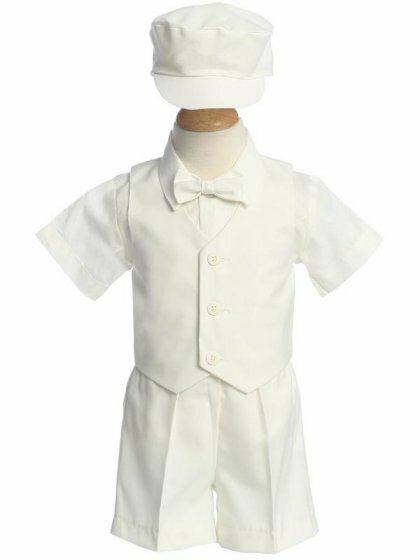 Lined vest, elastic waist shorts, clip-on bow tie, cabbie hat and ivory short sleeve dress shirt. Popular for spring special occasions and weddings. Also a cute Easter outfit. Check the General Size Chart for Knicker Sets, Shorts Sets and Eton Suits and choose carefully. - Special occasion clothes run small. Ships in 1 - 2 business days. Limited sizes and quantities. Discontinued. Priced for Final Sale.